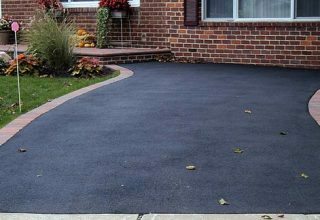 If you are planning to repair your blacktop asphalt driveway without professional help, the process will not be difficult if your driveway is a reasonable condition. However, if your asphalt is old and has many potholes and cracks, resurfacing it with fresh asphalt is the best long-term solution. A pot hole is a location where the asphalt is physically removed. When a driveway has a pot hole, it must be repaired. Spider web cracks look like a web, and alligator cracks look like alligator scales. These types of cracks are not difficult to repair if the cracks are small. Though, if the area is big, the project will require a lot of time and material. Major settling in the ground causes bird baths and sink holes after a driveway is surfaced with new asphalt. This holes form if the foundation was constructed poorly or if the base washes away. Holes also form when the sun’s heat warms the asphalt. The depression will make the asphalt crack in colder climates; over time, the cracks will lead to potholes. Professional driveway repair specialists recommended that homeowners clean the affected area first. There should be no debris, water, dust, vegetation, or anything that will adhere to the existing asphalt. Use a broom with stiff bristles and sweep around the area will requires repairs. If you don’t have this type of broom, you can use the broom that you have. If you need to clean your driveway with water, ensure that the area is completely dry before you start the repairs. The biggest problem is that water seeps in the cracks; if you cover the cracks, the moisture will never escape, and it will cause serious problems in the future. If you must use water, use it on a very hot summer day. Then, after 24 hours, you can safely apply your new material. If you have a gardening hoe, you can use the angled tip to remove vegetation from the cracks in your driveway. To use the hoe, place the angled end in the crack and pull the tool away from you. You can also use the hoe in sink holes and pot holes. Most driveway repairs are simple, but a lot of asphalt patching is required. You will also need an asphalt tamper tool. Asphalt patching can be purchased at a local lumber store; it is offered in 50 pound bags. A pothole tamper weighs eight pounds. It is usually eight inches, and it has a flat square head. When a hole is deeper than the asphalt, you must fill the hole with dirt, sand, or gravel. Do not fill the pot hole with patch because you will waste valuable material. Basically, a hole should always be four to five inches deep. This will help you save material, and it ensures that the new pothole patch and the old layer bonds properly. Overall, driveway repairs are not difficult, but projects can be very time consuming. If you don‘t have time to repair your driveway, contact Southern Asphalt. The specialists at South Asphalt tackle driveway repairs at residential and business locations.